Formally launched in February 2014, the Global Health Security Agenda (GHSA) is a five-year multilateral initiative aimed at enhancing public health capacities in order to better prevent, detect, and respond to both human and animal infectious disease threats. Now with nearly 50 partner countries committed to its collaborative capacity-building efforts, the GHSA has become increasingly visible at the international level as one of the most prominent health security frameworks today. Combining the priorities of the World Health Organization’s (WHO) International Health Regulations (IHRs), the World Organization of Animal Health’s (OIE) Performance of Veterinary Services Pathway, and its own proprietary set of 11 Action Packages, the Agenda attempts to elevate global health security as a priority at both national and international levels. As the GHSA moves into its second full year of life, questions of policy and its implementation remain at the forefront. The offices at the Centers for Disease Control and Prevention (CDC) are busy “learning by doing”, working for the first time to coordinate a large sum of money to design and implement a series of international projects with huge ambition, a great diversity of partners, and nearly unlimited geographic scope. The other major US Governmental implementer of the GHSA—the United States Agency for International Development (USAID)—is busy extending its previous projects, now rebranded as a flagship components of GHS work. The US Departments of Health and Human Services (DHHS), Defense (DOD), and State (DOS) continue to push forward in an effort to figure out how to transform a project ostensibly about capacity building heavy on the “bio”, loose on the “systems”—into both a rallying cry for non-governmental organizations as well as a diplomatic platform for multilateral global health efforts. Led by a strong managerial and visionary team out of the National Security Council (NSC), the Agenda has been gaining momentum after a relatively lackluster start—due in no small part to an initial international hesitancy to jump on board a US Government-led initiative aimed at transforming the practices and priorities of global health. There is no obvious way to parse out what makes effective policy and programming in this novel space. While there are precedents one can look to — PEPFAR, PMI are good examples — few have had the same scope or ambition as the GHSA. Certainly none have had the unique combination of fragilities that accompany the extensive work that goes into building robust multisectorial cohesion—aligning the security, policy, and public health communities. Add to this the task of harmonizing domestic and international aspects of programming, and the challenges multiply. Relevant actors also multiply: dedicated work spreads across the Department of Health and Human Services, at the Office of Global Affairs; the CDC’s Division of Global Health Protection; the Department of State’s Bureau of International Security and Nonproliferation; USAID’s Global Health Security and Development Unit; and the DOD’s GHSA Coordination Cell. Tied together by diverse flows of information, meetings, and varied mechanisms of coordination, the GHSA presents a great challenge across an increasing number of both governmental and non-governmental offices. With a five-year timeline that overlaps the end of the Presidential administration that nurtured its early years, and a Congress seemingly reluctant to extend funding to additional public health emergencies, the GHSA suddenly appears quite unsettled. Its organizational and political challenges notwithstanding, the Agenda has nevertheless found some significant success, particularly in the early phases of its international and multilateral component—combining a strong push for IHR compliance with discrete measures and indices for incremental capacity improvements. One of the best examples of its international visibility and credibility came last year when South Korea, in the midst of battling an unexpected MERS outbreak, turned to the GHSA as a platform to invest both diplomatic commitment as well as approximately $10 billion US dollars—in addition to graciously hosting the annual GHSA Ministerial High-Level Meeting. The recently published WHO Joint External Evaluation Tool (JEE) is another excellent example of some of the concrete achievements that show the Agenda can be ‘hybridized’ into more than just 11 packages of indicators and targets. With a small, but strong international team from Finland coordinating a first round of voluntary external baseline assessments of public health capacity (complimented and compared with in-country self-assessments) – the JEE illustrates how the GHSA has produced not only momentum, but specific mechanisms for transparency and cultures of accountability. Yet, sustaining momentum and buy-in is clearly not only a question of a continued proliferation of metrics for assessing public health capacity and capability. Instead, a small roving band of evaluators—made up of experts from international private and public organizations—has become one of the key instruments producing a tangible sense of importance and urgency to this Agenda, one felt well beyond the confines of the capital. All eyes turn now to the US commitments to the GHSA through the embryonic programs coordinated by both the CDC and USAID. Clearly the Agenda presents a significant challenge to policymakers, project managers, and global health actors from a broad variety of sectors, both governmental and non-governmental alike. 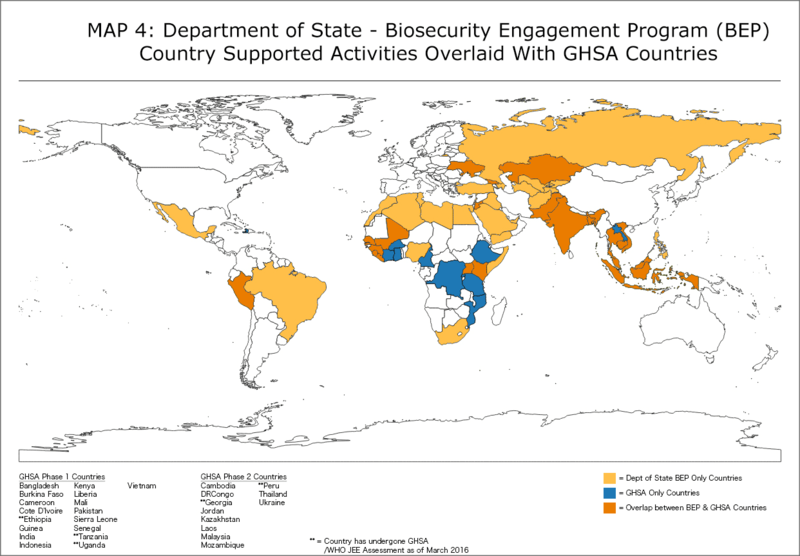 As outlined above, the US commitment to the GHSA is preeminently a governmental initiative–pulling together a vast collection of pre-existing and repackaged biosecurity, global health, and health policies and projects. This includes USAID’s second iteration of its Emerging Pandemic Threats Program (EPT-2, including PREDICT-2), CDC’s Ebola partners and GHSA-specific technical implementers, the Department of Defense’s Cooperative Biological Engagement Program (CBEP), and the similarly-named Department of State’s Biosecurity Engagement Program (BEP). Each of these projects maintains a semblance of continuity to what they were before the GHSA, but the Agenda undoubtedly has produced significant changes to their structure, scope, and coordination—not in the least by giving them a common platform of indicators, objectives, and priorities. In addition to this common platform is a considerable amount of inter-agency overlap in GHSA programming. Below is a series of maps that illustrates US Governmental activities related to the GHSA as of March 2016. 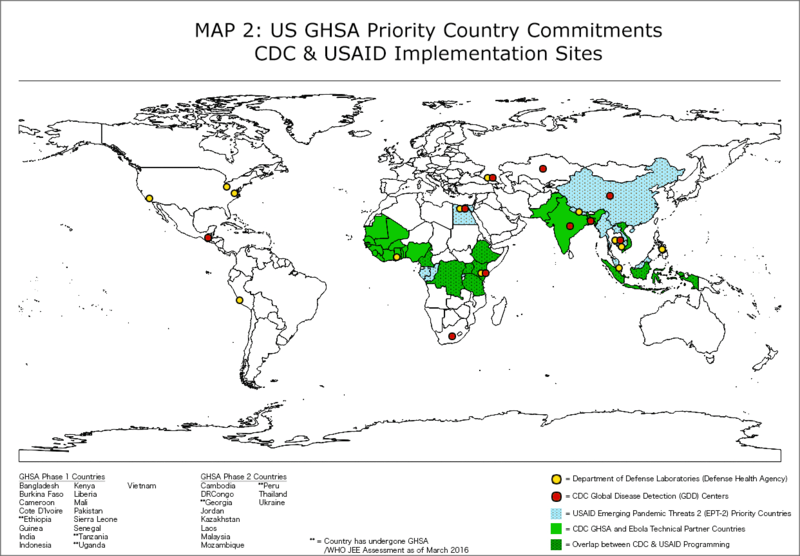 These maps present a comprehensive overlay of GHSA countries by phase, and analyze specific departmental program overlaps in priority commitment areas. This includes pre-existing DOD laboratory sites, CDC Global Disease Detection centers, as well as more recent CDC GHSA/Ebola grantee focal areas, and USAID EPT-2 priority countries. Map 1 shows the basic structure and timeline of the US programming for GHSA across the two separate phases of implementation and roll-out. Clearly there is significant tie-in with existing laboratory and public health centers run by both the DOD and the CDC in many of these countries. Turning more specifically to the intersections of public health and development, the next map (Map 2) highlights overlapping focal areas by both the CDC and USAID in their coordination of US commitments to the GHSA, through the partnership of 30-plus countries. Clearly both the SE Asian as well as the Central African regions represent important sites of coordination for the two agencies coordinating GHSA implementation. Much of CDC’s work in West Africa will be carried out by its technical partners, including large global health NGOs such as PATH, International Medical Corps, Partners in Health, and others. USAID’s EPT-2 work is likewise to be conducted by partners such as UC Davis and EcoHealth Alliance. 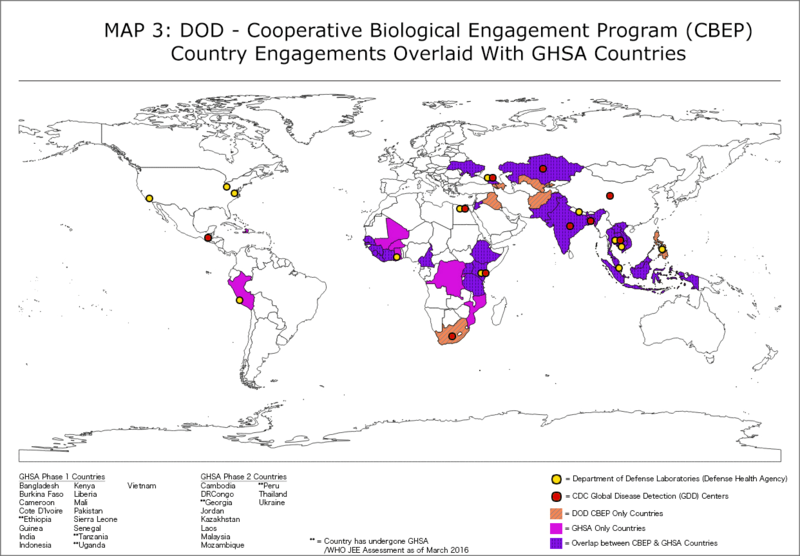 The next map (Map 3) turns to the security sector, illustrating how the DOD’s existing Cooperative Biological Engagement Program (CBEP) intersects with the country projects related to the GHSA. Although not directly involved in implementation, much of the effort to synchronize existing DOD programs with GHSA country projects is currently conducted by the GHSA Coordination Cell at the DOD. 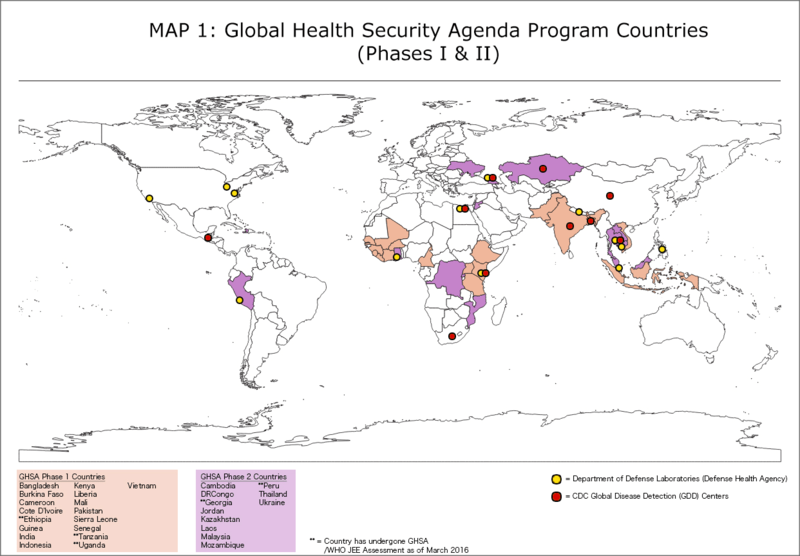 The final map (Map 5) illustrates the country intersections within the programs at all four agencies—CDC, USAID, DOD, and DOS: Kenya, Uganda, Vietnam, and Indonesia. These four countries are where all US Governmental agencies involved in the GHSA have existing or planned projects and programs. Alongside these countries, Ethiopia, Tanzania, and Cameroon contain additional sites of intersection between the DOD, CDC, and USAID. The multisectorial efforts between the DOD, CDC, USAID, and DOS will clearly need be strongest and most robust across post-Ebola programming in West Africa and the extensive networks across Southeast Asia, which represent the greatest areas of overlapping engagements under the GHSA. Further mapping should chart the various non-governmental projects and organizations working across these areas, either as directly a part of–or adjacent to–the GHSA. Speaking more generally, it is important to not take the ‘global’ in ‘global health security’ for granted. These maps are a first step in helping to identify and isolate the unique scope and reach of US Governmental activity under GHSA programs – and the production of a specific kind of scalar policy through the GHSA. Although the truism that ‘diseases know no borders’ might resonate after Ebola and now Zika, the novel forms of disease diplomacy designed to ‘prevent, detect, and respond’ to them clearly must still engage countries and their borders as part of the globalism they implement. 1 It is important to reiterate that neither DOD nor DOS are GHSA implementers, but are rather harmonizing and repackaging existing programs/projects through the platforms offered by GHSA. These maps intend to point out where GHSA and these existing programs intersect geographically. About the author: Raad Fadaak, M.A., is a PhD Candidate affiliated with McGill University’s Departments of Anthropology and Social Studies of Medicine, researching global health security, epidemic preparedness, risk reduction, and health policy development.